So while I was checking out at my local scrapbook store last Friday, I did a quick scan of the items near the registers. OMG! Paper Smooches stamps! I didn't have any of these stamps but I've been tempted many times. I just never pulled the trigger because they're not really my style and I wasn't sure I'd use them much. Like that's stopped me before, right? Well, seeing and touching them in person plus the 20% I get off as a frequent buyer pushed me over the edge and I snatched up a few sets. So cute! And he was a lot of fun to color. 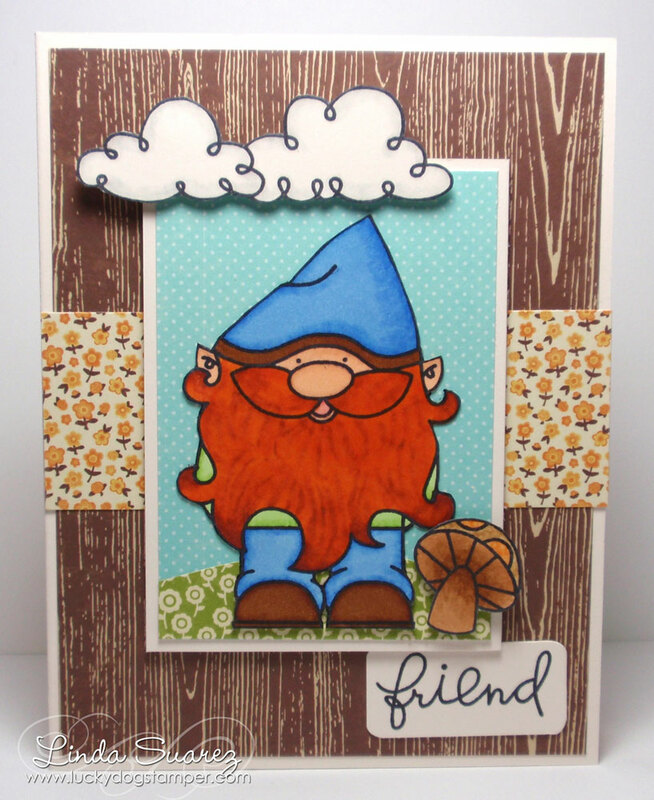 After stamping and coloring him, I cut him out and added some background patterned paper from the Jillibean Apple Cheddar Soup collection. I also stamped, colored, cut out and popped up the clouds and mushroom. A fun card to make. I used Freshly Made Sketch #24 by Rita Wright for the card. It is perfect for a large stamp like Jerome the gnome. Thanks for stopping by! Hope you have a great week ahead! Great job of coloring, and perfect with the woodgrain DSP! Thanks for sharing with us at Freshly Made Sketches! Love the papers. That image makes me smile; it is too cute! Thanks for joining us at Freshly Made Sketches.